Continuing the Audi tradition of offering exceptional design with precision, simplicity and technical integration, the A7 delivers a refined driving experience combined with excellent functionality. The award-winning sportback silhouette helps improve usability by enabling easier access to the spacious cargo area. The center console is oriented toward the driver, underscoring the vehicle’s sportiness. New for 2019, the five-door coupe delivers impressive technology such as the brand’s all-new MMI touch response® system and available advanced driver assistance systems including adaptive cruise assist and Audi pre-sense 360o. All new headlight and taillight technologies solidify Audi as a leader in lighting innovations. Standard equipped with an all-new 3.0-liter TFSI® turbocharged V6 engine mated to a seven-speed S-tronic transmission, which melds efficiency with dynamic shift characteristics, the new A7 offers customers more torque than the outgoing model. Additionally, the A7’s drive system is now more efficient due to a new mild-hybrid system (MHEV), based on a 48-volt electrical system. 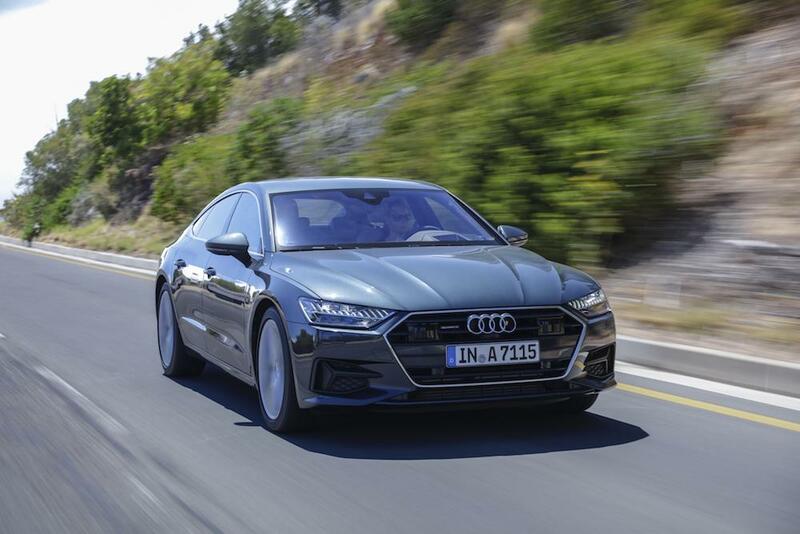 The all-new A7 offers the best of three worlds – the spaciousness of a sedan and versatility of a sportback, with the emotional design of a coupe. A minimal use of chrome on the exterior allows the A7’s distinctive body proportions to stand out. The transition of the D-pillar is the focal point for the new A7. The third side window, a design cue from the Audi 100 Coupe S, creates the recognizable sportback shape. At the front, the wide, low Singleframe® grille and large air inlets emphasize the vehicle’s sport-focused design, and the pronounced wheel arches provide cues to the standard quattro® all-wheel drive. The A7’s signature silhouette, defined by the sloping roofline, give the vehicle its unique character. From the side, the low set shoulder line draws the focal point downward while the window line rises toward the rear of the vehicle, conveying movement even while stationary. The back of the A7 tapers into an adaptive spoiler, which extends at speeds over 75 mph and leads down to the continuous light strip. Available S line® package which includes S line exterior details, titanium-black diffuser insert, illuminated S line door sills and fender badge, and a 20 mm lower ride height due to the sport suspension. Larger air inlets in the front bumper offer improved airflow to the radiators and direct airflow around the wheels. Standard 19” 10-Y-spoke design wheels with all-season tires or available 20” five-double-V-spoke design silver wheels with all-season tires. Prestige models also offer available 21” five-V-spoke-star design contrast gray polished wheels with summer tires. Standard power tailgate and adaptive rear spoiler. Standard power-adjustable, auto-dimming, power-folding and heated exterior side mirrors with memory. The modern interior of the all-new A7 fuses design and technology in a unique way. Three main horizontal lines create space. The orientation of the interior is strongly angled towards the driver, creating a driver-centric cockpit. A three-dimensional architecture designed around the MMI touch response system, including the black panel elements and virtually uninterrupted inlays, offer drivers and passengers a sense of tranquility inside the cabin. Available 18-way individual contour front seats with ventilation and massage function. Standard gray/brown fine grain ash natural wood inlays or available dark brown walnut wood inlays. The all-new A7 is a testament to the leading role Audi holds in lighting technology and design. Up front, the narrow headlights extend from the wider and lower Singleframe grille. The twelve adjacent lighting segments of the HD Matrix-design headlights, separated by narrow spaces, mimic the binary digits 0 and 1 and represent the A7’s digital light signature. HD Matrix-design LED headlights with LED daytime running lights and dynamic front turn indicators (standard on Premium Plus). HD Matrix-design LED headlights with Audi laser light and LED daytime running lights and dynamic front turn indicators (standard on Prestige). The laser light is indicated by the blue X in the lower portion of the headlight. Automatically controlled at 43.5 mph, the LED headlights with Audi laser light are 30 percent more energy-efficient than standard LEDs. The A7 is standard equipped with LED taillights with dynamic rear turn signals. Mirroring the digital light signature at the front of the vehicle, at the rear of the vehicle, left and right taillights are connected by a continuous LED light strip made up of 13 vertical segments. Fast-moving light animations play in the headlights and taillights when the vehicle is locked and unlocked (when equipped with the HD Matrix design headlights), emphasizing the vehicle’s dynamics while standing still. Light also plays an important role inside the cabin. Contour lights line the center console and door trim, precisely tracing the architecture of the interior and subtly highlighting the space. The all-new A7 offers two lighting packages: the ambient LED interior lighting package and the ambient LED interior lighting plus package, which offers customers more than 900 color combinations. Powerful and efficient, the A7 is equipped with an all-new 3.0-liter TFSI® V6 engine, which produces a wider range of torque compared to the outgoing A7, due to the addition of a turbocharger. The fitment of an exhaust gas-driven twin-scroll turbocharger, replaces the belt-driven supercharger from the previous model’s 3.0-liter engine. This advancement, along with a revised Audi valvelift system, results in +44 lb-ft of torque for the 2019 model, with peak production available at wider and lower RPM ranges. The 3.0T engine, coupled with a seven-speed S tronic® dual-clutch automatic transmission, produces 335 horsepower and 369 lb-ft of torque at a range of 1,370-4,500 rpm, and can sprint from 0-60 mph in 5.2 seconds. The S tronic transmission now transfers power to a quattro® drive with ultra® technology that is optimized for performance and efficiency. This quattro system with ultra technology allows for intelligent, proactive control of the all-wheel drive system to help predictively modify the torque application as the driver demands or the road conditions require. Another first for the 2019 model year, all A7 models will come standard equipped with Mild Hybrid Electric Vehicle (MHEV) technology. The 48-volt system is extremely compact – enough to be stored under the rear cargo floor. Power is supplied from the 10Ah battery to a belt alternator starter (BAS). A conventional pinion starter is used for cold starts only. Sophisticated powertrain management software uses route data and information from a network of vehicle sensors, including the forward-facing camera, to determine the level of assistance required by the 48-volt system. For 2019, the newly developed standard steel front and rear suspension for the A7 model line allows for both a sporty driving experience and more comfortable ride for long distances. The redesigned front five-link suspension with lightweight construction offers greater steering precision and excellent handling through optimized steering-rack placement direct at wheel centers. Four Audi drive select modes – auto, comfort, dynamic and individual – allow the driver to choose the option that best meets their driving situation and handling preferences. Available sport suspension (Premium Plus and Prestige models) lowers ride height by approximately 20 mm. Inside the A7, the all-new MMI touch response® system replaces the rotary dial and the conventional buttons and controls of the previous model with two large, high-resolution touch displays. Featuring both haptic and acoustic feedback, users can hear and feel a click as confirmation when their finger triggers a function. The upper 10.1-inch display (8.8-inch on Premium models) controls the infotainment and the lower, 8.6-inch display is used for climate control, comfort and convenience functions and for natural handwriting input with whole-word recognition. Users can write a word left to right, or in one spot, and the MMI is able to identify each letter. A full keyboard can also be used in the traditional sense of pushing each letter or swiping continuously like on a smartphone. In the new A7, comprehensive personalization options allow up to seven individual driver profiles to be stored, each with their own personal configurations. Within the MMI, each driver can create up to 32 “shortcuts” for easier access to most-used items such as navigation destinations or radio stations. Also new for this year, MMI search is based on free text input and natural voice control. The system will auto-populate lists based on a minimal amount of character inputs. Natural voice control helps create intelligent conversation with the driver and responds to both commands and questions. Drivers can speak requests such as, “Where is the closest coffee shop?” to which the A7 will offer the nearest options. The voice control system processes questions and commands through both the onboard stored data and detailed information from the cloud. Available second generation Audi virtual cockpit featuring a 12.3-inch display that offers HD resolution of 1920 x 720 pixels. The driver can choose between two viewing modes – classic and infotainment. The virtual cockpit helps to enhance the infotainment and navigating experience via the large Google Earth™ imagery or 3D city maps (requires Audi connect PRIME) supported with 4G LTE (where available). Available Audi phone box connects compatible smartphones with the vehicle’s antenna and charges the phone inductively. Available full-color head-up display projects relevant driving information in the driver’s field of vision. Standard Audi smartphone interface provides Apple CarPlay™ and Google™ Android Auto integration, making smartphone interactions easier for the driver. Two sound systems are offered on the A7. Standard on Premium Plus and Prestige models is a Bang & Olufsen® 3D Premium Sound System with 16 speakers, 15-channel amplifier and 705 watts, to create almost true-to-life surround sound reproduction. Available on Prestige models is the Bang & Olufsen 3D Advanced Sound System, which delivers musical enjoyment through 19 speakers, powered by the 19-channel BeoCore amplifier and ICE power amplifiers with an output of 1,820 watts of power. Audi Connect packages the applications that help connect the vehicle with the internet, the owner and the surrounding infrastructure (active subscription required). Launching later this year, the new myAudi app will offer A7 owners access to even more digital services through their compatible smartphone, including myAudi Navigation. This time-saving function becomes a personal mobility manager, where a route can be started on a smartphone, continued in the on-board system upon entering the vehicle and then passed back to the smartphone to guide the occupant to their next destination – by foot or public transport. The new A7 offers a comprehensive suite of standard and available driver assistance systems. All of these systems benefit from a zFAS central driver controller, which obtains information from up to 24 sensors and creates a digital picture of the A7’s environment to help compare, evaluate and derive strategies for the driver assistance systems. Available Adaptive Cruise Assist (ACA), a “hands-on” system that helps the driver with acceleration and braking, maintaining speed and following distance, and with lane tracking over a speed range from 0-95 mph and during traffic jam situation. Top view camera system (front, rear and side views) with virtual 360o surround view combines four wide-angle cameras on the outside of the vehicle to project a real-time 3D model of the A7, allowing the driver to toggle around the vehicle and zoom in and out to help with maneuvering in tight spaces.Audi pre sense 360o can detect potential front, rear and side collisions and can initiate specific preventative measures ranging from full emergency parking, preconditioning seat belts, raising windows and closing the sunroof. Available intersection assist monitors cross traffic when pulling through an intersection or crossing lanes and can notify the driver of a potentially hazardous situation by applying the brakes at speeds of up to 6.2 mph or with visual and audio warnings at speeds of up to 18.6 mph. Available Audi active lane assist and collision avoidance assist helps drivers steer around obstacles in critical situations by applying a slight steering torque and braking of individual wheels to help the driver make a necessary lane change. Vehicle exit assist (as part of Audi side assist) can help prevent incidents when moving objects are approaching from behind as the vehicle doors are opened with a visual red indication on the interior LED light strip of the door trim, acoustic warning, and new for A7, a one-to-two second delay in the door handle release. Rear cross traffic assist (as part of Audi side assist) supports the driver when reversing out of a perpendicular parking space and can help alert the driver through a brake jolt in certain situations, for example in the case of an approaching vehicle.